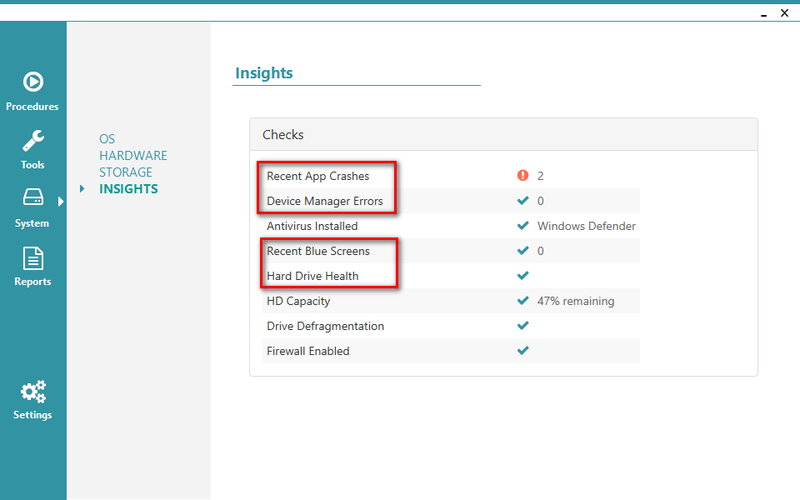 Our question to you is, are there other issues that we should be checking every device for? I know this has been requested for Kabuto, but how about a notification if System Restore is Disabled. @NGL, I can definitely see the use case for if Windows wasn't activated. What type of insight would we provide for Windows Installation age? If there's not much feedback to give, we could definitely put that in the system info area as well. Windows Installation age would only tell us how long since the system was reloaded, Only helps to know when the computer is acting funny and a reload would fix quicker that fixing individual issues. Another Idea came to mind would be Computer Age. We sometimes have customers that want their ancient computer fixed when it would be more cost effective to just get a new computer. Right on, thanks for the feedback! Would it be possible to alert us to any of these insights when we launch TechWARU? I feel it would be useful if, for example, I was alerted to the fact that the drive failed the SMART test at launch time, rather than having to view it via a report. Keep it in the reports, but also have it visible within the UI. The current System Information page is a placeholder, we have a nicer looking one in the works and viewing Insights will be an option on that page so you'll be able to view them outside of running a tool/procedure! Customized/pre-configured and Web-Synced (using the portal) to be consistent across all installs. The #1 thing I always do on a client PC is to check the HardDisk (using CrystalDiskInfo) - as i won't proceed with any "service" on a client PC IF the drive shows errors or degradation. Consider this part of the new "Insights" and again make it a customized and scheduled feature so that we get reports and it also self-remediates.. This is also something I do. I totally agree guys. This is a solid idea and one that we could certainly build a great solution for. We'll see what we can do for you. It could be on when av is installed and that could be an issue? ...all signs of settings changed by malware that aren't picked up by most AV software. I'd like to see one click access to the details of anything that gets flagged on the insights page. For example, Recent App Crashes, allow one click on the result (or the name) to show details of the app crashes. This can also be useful with Device Manager Errors, Recent Blue Screens and Hard Drive Health. With Win10 it seems the major updates install as new Windows installs and reset that counter. Just saying this could be very misleading. I think the one click would be awesome especially if there is malware found. It would be better if the insights from the report offered the malware info - infected files, malware type, right there instead of scrolling down to read it. At this point "Recent App Crashes" is only informational in Insights and Reports. Is there any way to tell what apps crashed and when - like what Kabuto shows?